I love making customized tea brews, particularly during this time of year, when we need some extra nurturing and love. 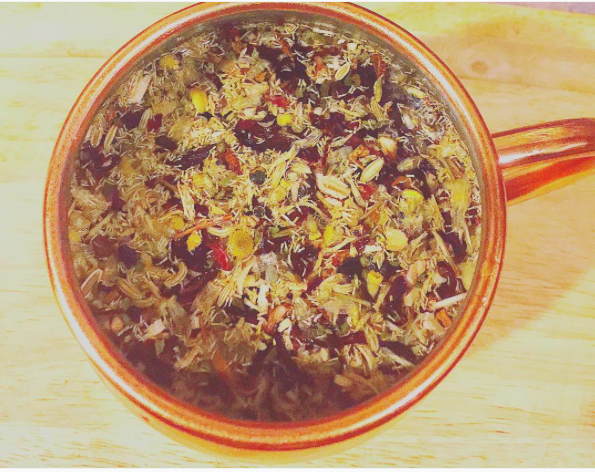 I've been working on chakra balancing lately via yoga, and came up with this tea that really supports the 3rd and 4th chakra. Fourth chakra: Self-love, Ego, Loving others. Even though this tea supports the heart, digestion, and immune system, it is very heart-centered. And I think we all need some heart-centered vibes in these times. 🌿Chamomile (one of my most favorite herbs)~great for digestion and relaxation. 🌹Rose hips and hibiscus ~ for heart health and the heart chakra. 🍃Lemon balm ~ for immune support and some sweetness. Let me know if you try this tea!